Today’s selection of words are magic: incantations that summon mysterious powers and set spells in motion. Nowadays they’re all considered rather childish and funny, but they come from a variety of original sources. And once again we have a lot of interesting etymological theories, with a lot of question marks to go with them. hocus-pocus - Dating from the early seventeenth century as a magical formula used in conjuring, the word was apparently first a stage name used by “jugglers” or magicians. It may be a corruption of the sacramental blessing from Catholic Mass “Hoc est corpus…” Support for this theory comes from the equivalent phrases in other European languages, which also appear to be corruptions of elements of Catholic ritual. 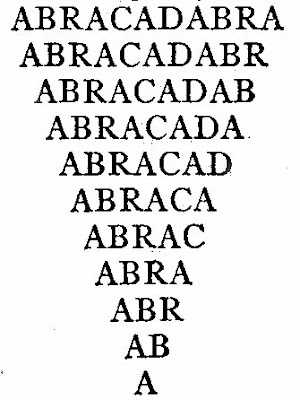 But it may derive instead from the pseudo-Latin phrase “Hax pax max Deus adimax,” also used as a magic formula. 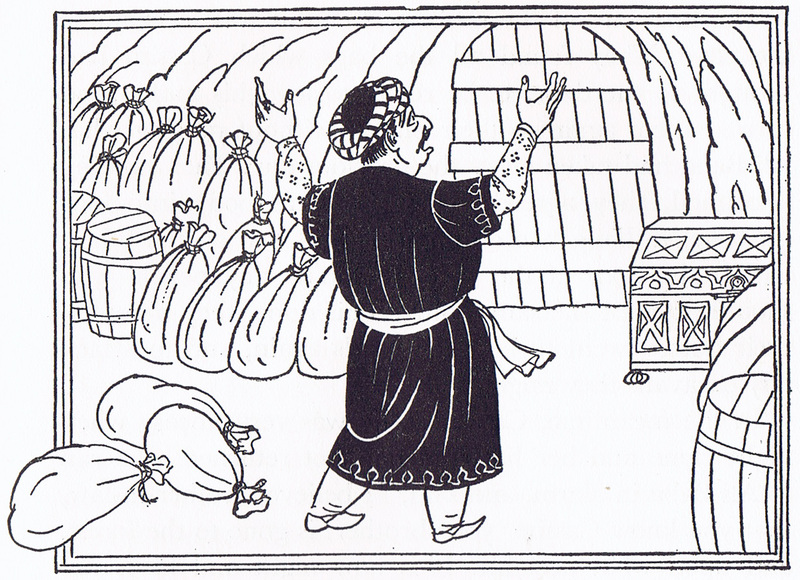 Or it may be from “Ochus Bochus,” a Norse magician and demon of folklore. Or perhaps it was just random nonsense, with the full phrase given in 1656 as “Hocus pocus, tontus talontus, vade celeriter jubeo.” In any case, it seems to have been made up by performers with no belief in actual magical powers. 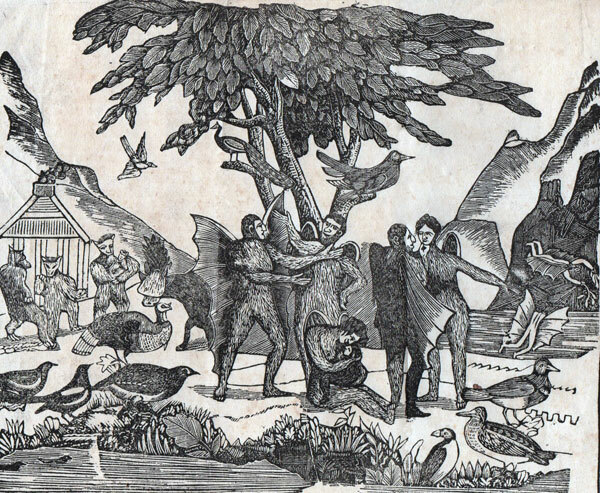 mumbo-jumbo - First used in 1738 and alleged to be the name of an idol worshipped in Africa, the phrase may or may not come from the Mandingo name Maamajomboo described in the Encyclopaedia Britannica in 1803. 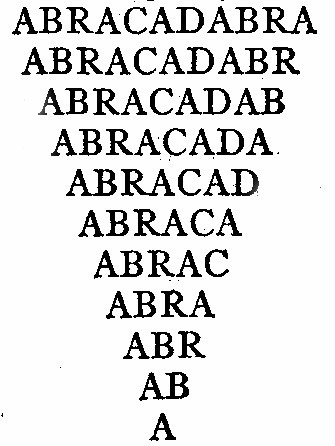 By English speakers this phrase came to be used to mean “an object of senseless veneration or a meaningless ritual.” As a word in English, therefore, it was never intended to be taken seriously by magician or audience, and is indicative of magic that we assume to be false. Open, sesame! - Speaking of the mystical East, this phrase comes, as you probably know, from the story of Ali Baba in the Arabian Nights. Its first appearance is in Antoine Galland’s Les Mille et une nuits from 1704-17, whence it was translated into English. Interestingly, Galland is the one who added the story when he first translated the story collection One Thousand and One Nights, so although he may have heard it from a storyteller in Syria, no earlier form of the story has been found. So, why sesame? Unknown, of course, but possibilities include a rare literary word in Arabic that’s the same sound as sesame (simsim in Arabic) but which means “gate.” Or a reduplication of the Hebrew sem meaning “name,"
thus being a kabbalistic reference to God. Or that certain Babylonian magic practices made use of sesame oil. Or who knows what. 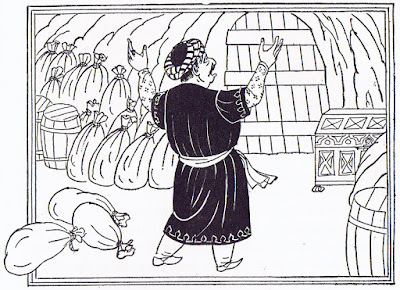 In any case, Ali Baba’s dim brother takes the meaning at face value and, when he can’t remember the password, guesses various other seeds: “Open, barley! Open, chick-peas!” This would presumably be even funnier to the tale’s original audience if indeed there were some particular magical significance to the word sesame. 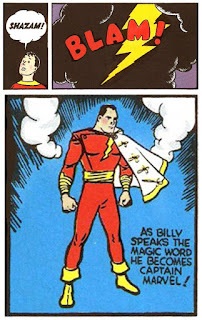 shazam - Apparently invented in 1940 by Bill Parker for the Captain Marvel comic series. Shazam was explained as an acronym of the first initials of various powerful figures: Solomon, Hercules, Atlas, Zeus, Achilles, and Mercury. In the comic its utterance turned our Ordinary Guy into our Hero, and it soon became used as an exclamation at a sudden and surprising change or occurrence. presto - Going all the way back to the 1590s as part of conjuring patter, it comes from Italian for “quick, quickly.” Now it’s often used in combinations such as “Hey presto,” and “Presto-chango.” Interestingly, the same word was borrowed into English again as a musical notation, but not until about 1683. Gutenberg wasn’t the first to print with moveable type. The nearest comparable effort with movable metal type was printed in Korea in 1377. The 42-line Bible wasn’t Gutenberg’s first product. He’d already done some broadsheets and even pamphlets before undertaking the massive production that was the 1286 page, two volume Vulgate Bible. ink, by hand. 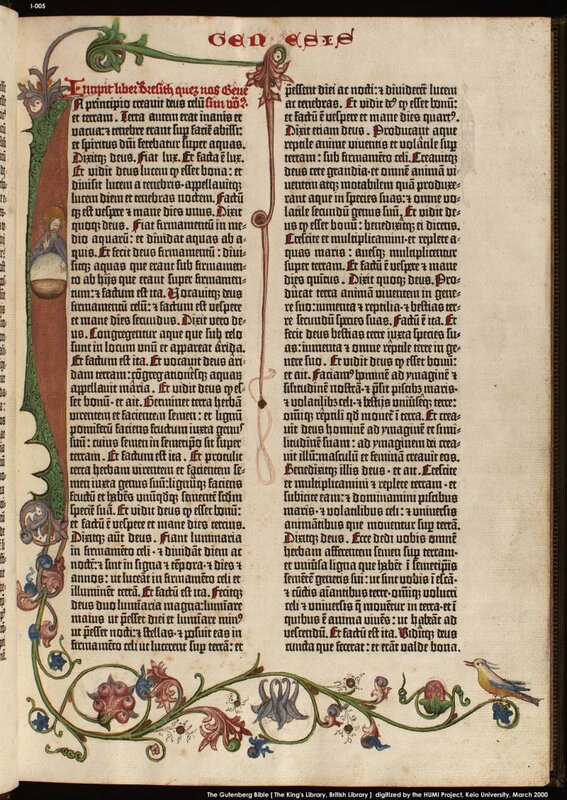 After about 10 pages he started spacing his lines a little more closely together so as to fit 42 lines of type per page, thus saving himself about 30 pages per Bible. 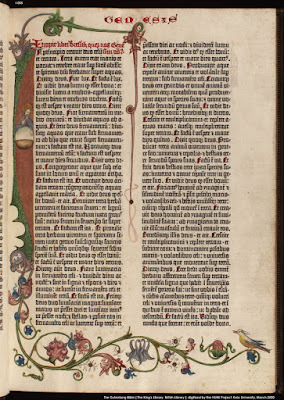 Later when the print run was enlarged, the extra copies of these initial pages were made to match the rest of the Bible. So, there are versions with some printed rubrication and some without, there are versions with some 40-line pages and some without, there are versions printed on paper and some on vellum, and any hand rubrication and illumination done on each copy will be unique, meaning that no two copies of the Bible are identical, despite its being the first mass-produced book. When I was in 7th grade I received an “excellent” award at the district competition of National History Day with my project about the invention of the printing press, so obviously I’ve been interested in this stuff for a long time! And in truth, it’s hard to overstate the importance of the technology or how it’s changed and enriched life. But despite the continuing advances in information dissemination, there’s still something especially beautiful and magical about the pressing of ink onto paper, one sheet at a time. We saw lots of lovely mythical beasts in Ireland! It’s worth noting that with ancient depictions of creatures, especially medieval and earlier, it’s not always easy to tell the difference between real animals and mythical ones. Note, for example, the wonderfully bizarre elephant holding up the castle in the first carving. This obviously is the work of an artist who was no more likely to see an elephant than a griffin, and to whom both beasts were equally exotic, improbable, and real. 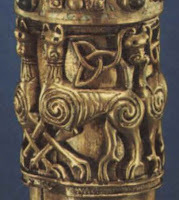 There are many creatures in Celtic artwork that are not readily identifiable. They could be monsters, or they could simply be odd dogs. 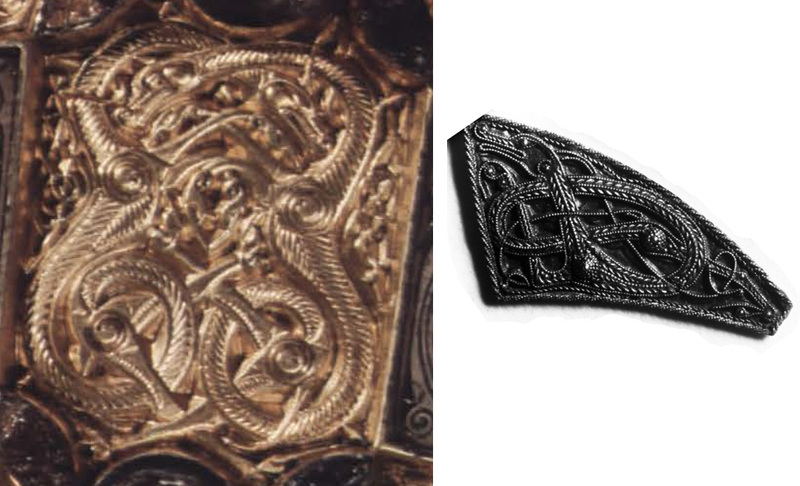 Even so, fantastical creatures turn up everywhere you look in Celtic art, and I took great pleasure in spotting them on our recent travels. 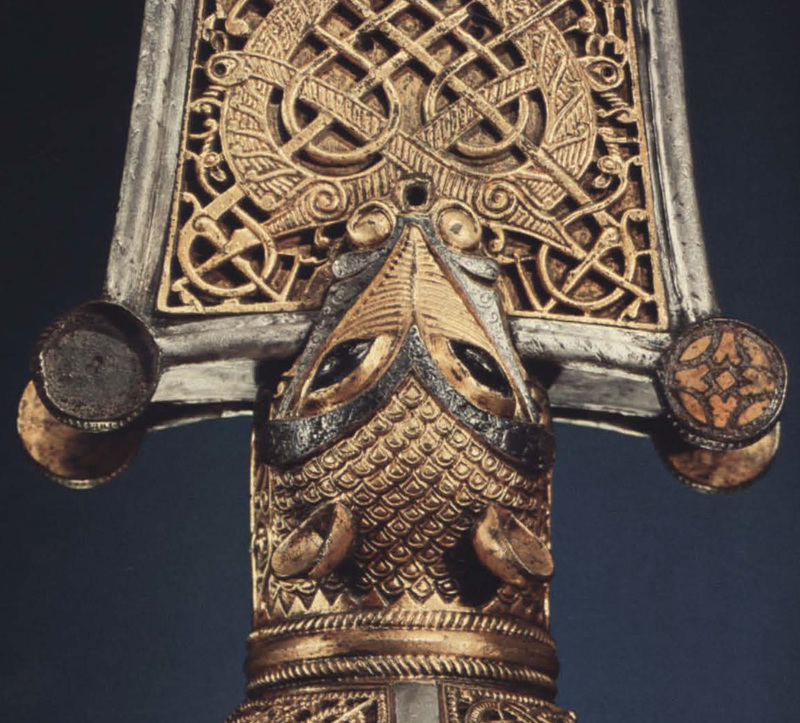 I should mention the Book of Kells and the Book of Durrow, although between the crowds and the dim lighting it’s nearly impossible to get a good view of the Books in person. I didn’t spot any mythical creatures on the pages that were open for display on the day we went, but I include a couple of illuminated animal selections anyway. 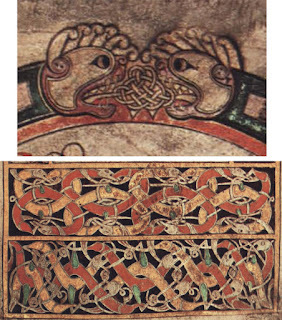 The animals in the Book of Kells are mostly real, but the number and charm of them sprinkled everywhere is one of the things that makes this illuminated book unique. knotted dragonish creatures. 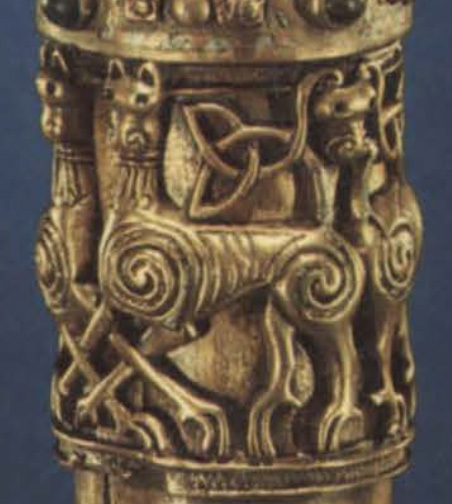 The crozier of Clonmacnoise is supported by gorgeous leonine beasts. 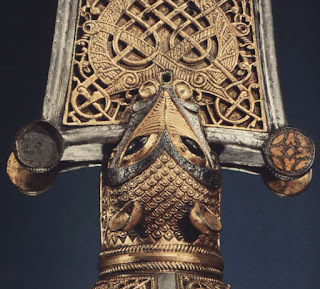 And one of my favorites is the wonderful opossummy head on the Cross of Cong. It’s probably not meant to be a mythical creature, but since I certainly can’t identify it, I’ll count it as something cryptoid! 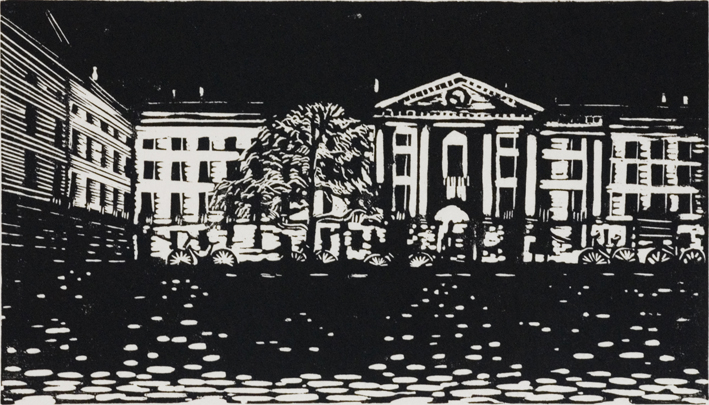 This second selection of Irish block prints features scenes of Dublin, and I’ll begin with another piece by Paula Pohli, whose work I shared last week, as well. 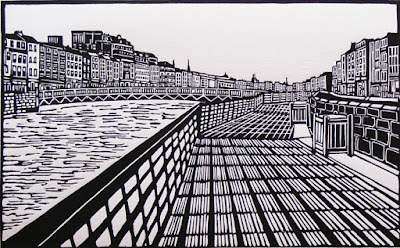 This one is a contrast from her dramatic dolmen view, and it sticks to black and white, with an emphasis on all the different geometric patterns of the city (plus the wigglier texture of the water.) I really like the variety of lines and rectangles, some black on white, some white on black. Somehow the completely plain, blank white sky reads as gently overcast, which is right for Ireland. Next, for contrast, is a black sky, perhaps a clear night. 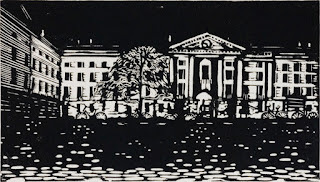 This is a view of Trinity College by Mary Grey. The foreground looks almost abstract, while edges of the roof melt into the background. Yet despite the lack of precise detail in this piece, the circles and stars of the bicycle wheels lined up along the front of the building make a fun and beautiful detail. 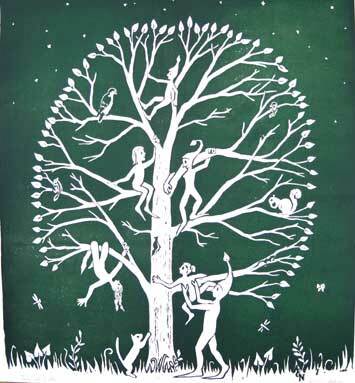 The third piece, by Mary Plunkett, is an illustration of one of the stories in James Joyce’s Dubliners. 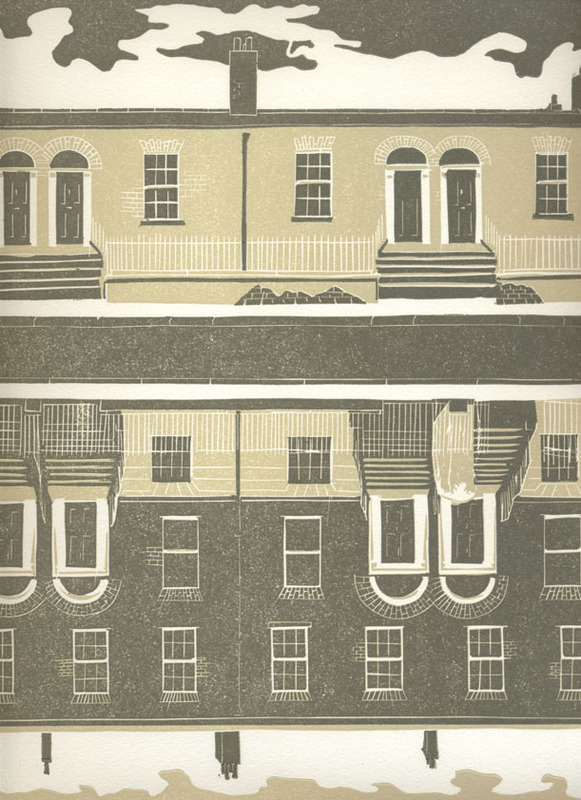 It’s titled after the line “she heard his footsteps clacking along the concrete pavement and afterwards crunching on the cinder path before the new red houses..” I confess that I don’t know the story, or why these houses aren’t red! Perhaps there’s some special significance in the interesting viewpoint of this street, with the two sides sprouting away in both directions. Note the typical Dublin fanlight arches over all the doors, even if these have no tracery details and are more modest than the famous Georgian show houses. They’re very simple, without any signs of life - no plants or flowers, no curtains in the windows. This adds to the emptiness and unreality of the street. 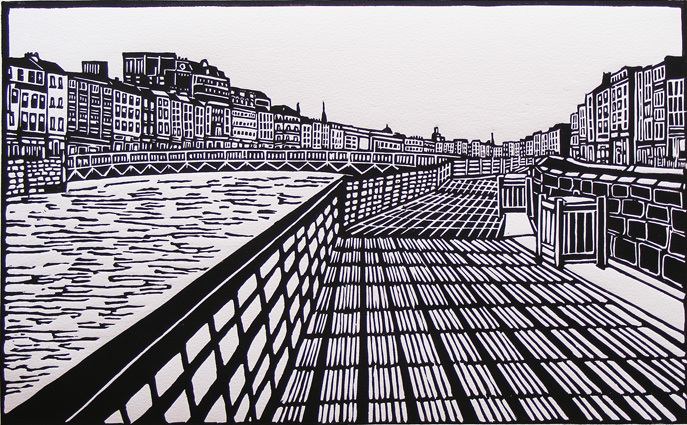 In fact, all three of these pieces show a Dublin devoid of people. In terms of art that’s just fine with me - I usually prefer my landscapes people-free, but you have to admit it’s a pretty unrealistic image of the bustling, buzzy city of Dublin! This month marks the 180th anniversary of the publication of Sir John Herschel’s most extraordinary discoveries, including the invention of a new telescope 24 feet in diameter and with a hydro-oxygen microscope lens that allowed him to see the surface of the moon in unprecedented detail. Indeed, it allowed him to discover life on the moon. 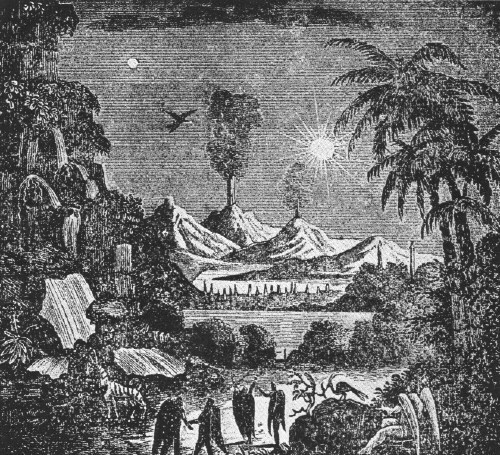 The life that was reported included red flowers covering the surface of the rock, bison, bluish grey goats, and an amphibious spherical creature which rolled with great velocity. Even more extraordinary, Herschel saw tribes of biped beavers that lived in huts and had mastered the use of fire, and finally the Vespertilio-homo, winged humanoids covered with glossy, copper-colored hair. Yowza! These amazing discoveries received widespread press, and created much excitement, as you can imagine. So how is it that you’ve never heard of these discoveries? Well, obviously, it all turned out to be a hoax. (Oops, I guess I gave it away in the title of this post.) It was, however, one of the greatest and most successful popular scientific hoaxes of all time, and in 1835 perhaps the first mass-media event, driven by the high circulation of the New York Sun with its steam-powered printing presses and its innovative use of newsboys shouting out headlines for all to hear. Poor Herschel, who was in South Africa at the time, had nothing to do with the hoax. Apparently he was initially amused when he heard about it, but eventually became irritated at perpetually being pestered about it. If you want to know all the details about the hoax, its reception, its author, and the history of the newspaper business which made it possible, check out this article from the Museum of Hoaxes. One interesting thing about it is that even the many skeptics seem to have enjoyed the story as fiction, rather than being outraged by the inaccuracy and downright dishonesty of the New York Sun. It seems that the tabloids have always been more about entertainment than truth, and at least exciting science fiction stories are better entertainment than slanderous gossip about unhappy celebrities. Just hold onto your skepticism when the popular press announces the discovery of biped beavers on Pluto! This summer we’ll be going to Ireland - I’m so excited! 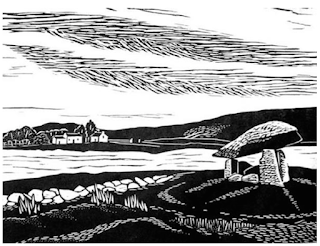 To get in the spirit I’ve collected some block prints of Irish scenes. (I’m very much hoping to get material for some future Irish block prints of my own, of course.) I’ll begin today with scenes from the western side of Ireland. 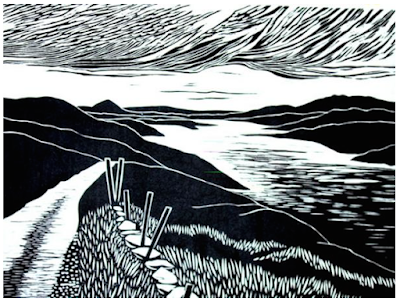 First, two by Gail Kelly, who works in County Down in Northern Ireland, but who has prints depicting many places in Ireland. First, a scene of Connemara, which is roughly the western part of County Galway. I especially like the texture of the sky and water. This piece has lovely light. 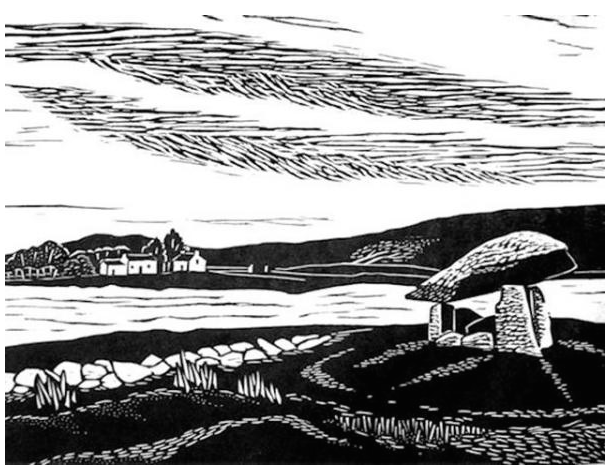 The second of Kelly’s pieces shows a dolmen in County Donegal. We won’t be making it to Donegal, but we will be seeing plenty of dolmens and other archaeology. The juxtaposition of the prehistoric monument right across from the modern village is one of the things that makes Ireland so special: it wears its thousands of years of history on its sleeve, and everywhere you go the past rises up in stone. 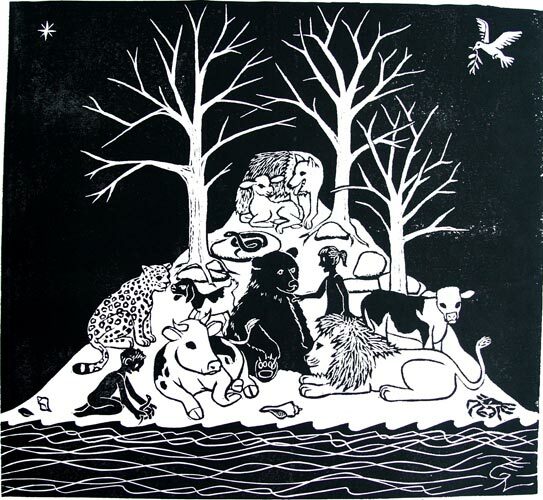 I found another block print of a Dolmen, this one by Paula Pohli, whom I take to be working out of Dublin. Her dolmen is clearly in the Burren, an area in County Clare that’s just peppered with neolithic sites. The ground composed of slabs of limestone is the Burren’s geological trademark. I’m not sure how I feel about the dolmen being in red. It certainly gives it a dramatic punch, and without it the grey stones of the dolmen would blend in with the grey stones of the Burren. But it also reminds me of the paperback cover of a cheap shocker! I do like the darker grey sky, though, and the vertical format is an interesting choice. I’m late with my post and even later to celebrate the International Day of Friendship which is set by the United Nations as July 30. However, it turns out that many countries celebrate Friendship Day on the first Sunday in August, so I’m right on target after all! And in honor of international friendship, here are words for “friend” in lots of different languages. To make it more interesting, I’ve grouped them so that you can see some cognates. Cognates, in case I’ve never mentioned it before, are words in different languages that share similarities of sound and meaning because they derive from the same ancestral word. (For languages with different writing systems, I’ve given the Romanization so you can get the gist of the pronunciation. I also apologize for lack of diacritical marks on many of these words. I don’t know how to type them!) Of course plenty of languages, like English, have more than one word for “friend,” but here I’ve simply listed the one that came up first in the dictionary. And of course the last group is all the words that don’t share any other cognates on my list. One thing that’s especially interesting about the words humans use for “friend,” is the variety of etymologies. Many come from roots having to do with love, including friend, amigo, filos, and cara. Bengali bandhu comes from “to tie,” while Arabic sadiq comes from “to tell the truth.” The Japanese and Latvian words come from roots having to do with company. There are languages whose words for friendship come from “sharing,” and others that come from “caring.” In short, there are many facets to friendship, and many ways we can talk about it. But don’t just talk - go out and do something about it!